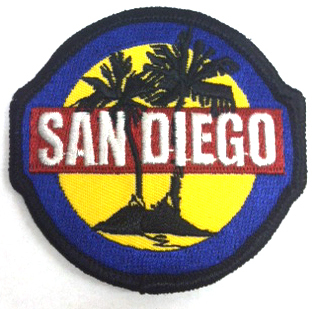 City and state patches are popular souvenirs for travelers and vactioners. Embroidered patches are one of the most popular souvenir items collected by tourists. Vacationers looking for small, inexpensive and easy-to-carry items to remember their travels are avid collectors of embroidered patch artwork denoting their trips. These travel patches can be displayed in picture frames, sewn directly on to jackets (especially ski parkas) or blankets in groupings or simply collected and stored in boxes or bags. If the patches currently available on the eBay auction website are a reliable indicator, one of the most popular patch categories is U.S. National Parks. While there is no official protocol for embroidered artwork, nearly every national park, national monument, historic site and national recreation area is depicted in colorful threadwork designs sewn on an embroidered patch. Many popular tourist attractions are illustrated on embroidered patches. Tourist patches have been around for decades and are usually very specific to the location. At Niagara Falls, several different patches can be found in the gift shop on Goat Island. At the base of the Santa Monica pier outside of Los Angeles, California, completely different patches are found. The reason is obvious, tourists like to buy souvenirs that remind them of their trip to a particular place and the embroidered patch is a very inexpensive souvenir to buy. Another popular travel patch category is U.S. cities, with embroidered designs usually depicting an urban landmark like the St. Louis Gateway Arch, San Francisco cable cars or the Seattle Space Needle. Individual U.S. state patches are often produced for collectors, and many of the state patches are die-cut designs in the distinctive shape of the state. 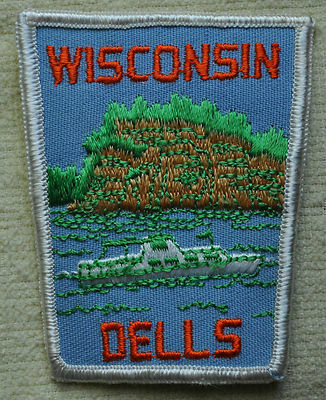 Vacation destinations pictured in embroidered patch design are frequently tied to such recreational activities as scuba diving in Belize, hiking the Appalachian trail or skiing in the mountains of Colorado. Skiers are avid collectors of embroidered patches, showing all of the mountains they have visited. There does not seem to be one company that dominates the tourism patch business and many different manufacturers have made patches for the tourism industry. The Chicago Embroidery Company has made patches for museums like Museum of Natural History in New York and zoos like the Cleveland Zoo, but their largest category seems to be ski resorts. The Chicago Embroidery Company made patches for such destinations as Vail and Aspen in Colorado, and Alta and Snowbird in Utah and other mountain resorts. The reason why, in this author’s opinion, is the owner of the company at the time enjoyed skiing in the western United States and probably quoted on patches when traveling on his vacations. International patches are another vibrant collectors market, with designs featuring writing in English as well as the native tongue of the land. Patches depicting the individual country’s flag are also available and are avidly pursued by collectors. Often times patch collectors choose certain categories of patches to collect. For the dedicated collector, travel and tourism patches are a popular category with many different and ever changing patches. 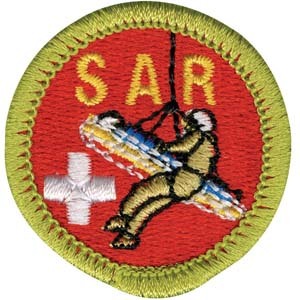 Merit badges with silver bordered are required for Boy Scout rank advancement. he has earned. 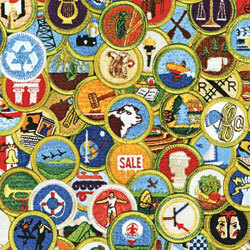 With 133 varieties http://www.scouting.org/meritbadges.aspx (scroll down for pictures and alphabetical listing), plus historical and discontinued versions http://en.wikipedia.org/wiki/Discontinued_merit_badges_(Boy_Scouts_of_America), there is a strong community of Scout merit badge collecting enthusiasts. New computerized technology permits beautiful embroidered designs. Scouts earn badges by fulfilling badge requirements, demonstrating skills, knowledge and the completion of specified projects. Merit badges include many topics in careers and occupations (i.e. dentistry, engineering, nuclear science); nature (reptiles and amphibians, forestry, gardening, fishing); sports (waterskiing, golf, snow sports, rifle and shotgun shooting); hobbies (pottery, coin collecting, reading) and many, many other interesting topics, even welding and space exploration. Oscar-winning film director Steven Spielberg helped develop a cinematography badge, he could only earn photography badge when he was a Scout. New merit badges are added every year. 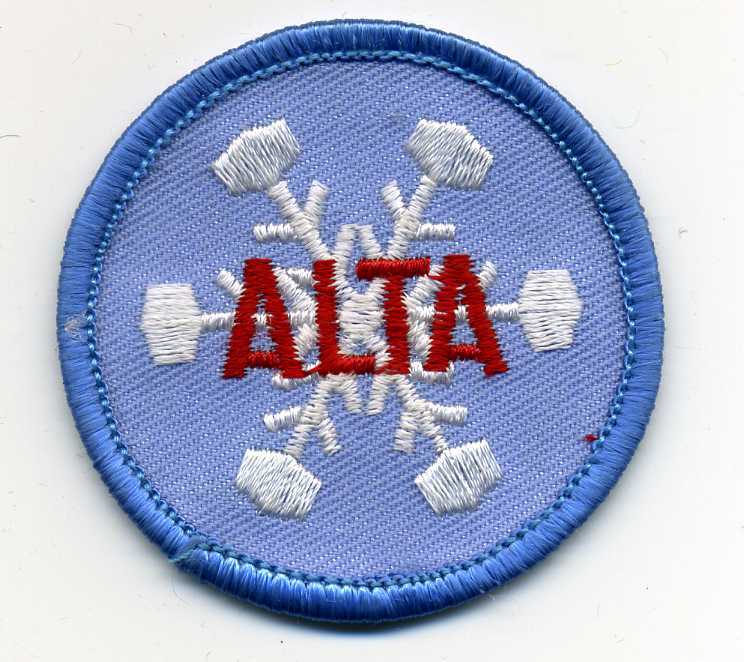 Also sought after by collectors are merit badges that have been discontinued by the BSA. 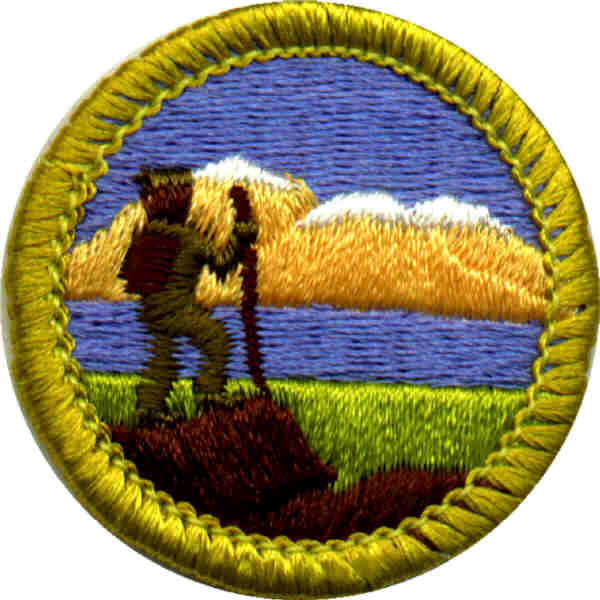 http://en.wikipedia.org/wiki/Discontinued_merit_badges_(Boy_Scouts_of_America) . Things like consumer buying, food systems, masonry and rabbit raising have been blended into other related badges. Computerized embroidery design and sewing techniques have allowed the images on the half dollar-sized round badges to become much more complex and detailed. As designs have evolved over the years, the collectability of the old designs has increased. Other designs remain unchanged. Twelve merit badges are required badges, all must be earned for the Scout to advance to the rank of Eagle; 21 total merit badges are needed to earn Scouting’s highest level, with additional palm honors for Eagle Scouts who continue to earn more merit badges . The required badges include camping, swimming, citizenship in the community, in the nation and in the world, communications, emergency preparedness or lifesaving, environmental science, family life, first aid, personal fitness and personal finance. 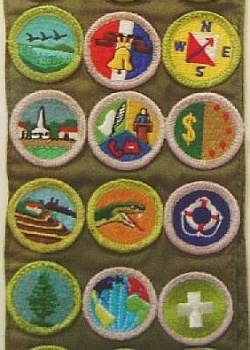 Required badges are easily recognizable by the silver ring around the edge; other merit badges have an olive green circle. There are more than 130 merit badges and some Boy Scouts have earned all of them! earning every available merit badge http://www.sj-r.com/top-stories/x1655031820/Riverton-Boy-Scout-enters-exclusive-club-with-132nd-merit-badge ; http://www.kvue.com/news/Boy-Scout-earns-record-number-of-merit-badges-162735546.html .